Manhattan Review presents a broad scope for MBA students to retake GMAT examination. Stand in the forefront of garnering a big score with the best test-prep curricula in the world. We have the greatest knowledge hub worldwide. You will be assured to be a top contender to get enrollment in top B-schools across the universe. We make you 100 percent confident to retake the GMAT test for a better and bigger score. The first step towards such goals is time management. For example, study hours, practice drills and mock tests. Additionally, go for one-to-one training while going for GMAT Test-prep. Initially, create a study plan that you must follow with a strong belief of being successful. The purpose of retaking GMAT exam is to get a better score. Therefore, plenty of hard work is involved. Follow your daily plan of study in a strict manner. The GMAT examination, including GRE, can be retaken five times in each year; GRE after every 31 days. GMAT after every 16 days. Comparing your score with other student’s who apply in top B-schools, begins with looking for a score above the average score required for admission. Almost all the management colleges display the scores of the student’s that are enrolled in MBA program. However, at the end of it all, it is the competition, which you need to face that plays an important role. For example, Columbia Business School had an average intake (enrolment) of 730 plus. So, your previous academic record must be good or else you must score 80 percent in GMAT examination. The general range of GMAT score was in between 530 – 790. Every good and perfect training gives the opportunity for the students to score big in GMAT. A student’ with a score of 530 has been given enrolment in 2019 batch for MBA program. This does not mean that you don’t need to retake a GMAT Test if your scored 600. 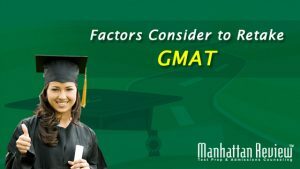 The admission strictly does not depend on GMAT score. The presentation of application is considered for a closer look. The competition you may face in the B-school that you have chosen to get enrolled must be taken into account. You may be from a simple environment, but you are aware that there are several others who sent in their application to the same B-school; it is your GMAT score that is considered in the admission for MBA program. However, if you have a real impressive academic background with an excellent profile, a decent score in GMAT 550 to 600 plus or even lower could get you an enrolment as well. The management and staff in B-schools look for students with a balanced profile. It is to determine their realistic qualification to consider their enrolment. For a someone with an uneven score other factors, including on the job experience is given preference. You may be a confusion if your MBA application will be given acceptance. Our Admission Counseling Services team will provide all the help to know how to apply in the B-schools that you have targeted. A brand image is created to back up your profile for getting enrolled. We will recommend your application to the top MBA schools.